The “City View” unit sleeps 4 people. It has two bedrooms, both with queen-size beds. This unit is on third floor, and has a great view of the city. It is a contemporary style unit. There are three flat screen TV’s– one in each bedroom, and one in the living area. 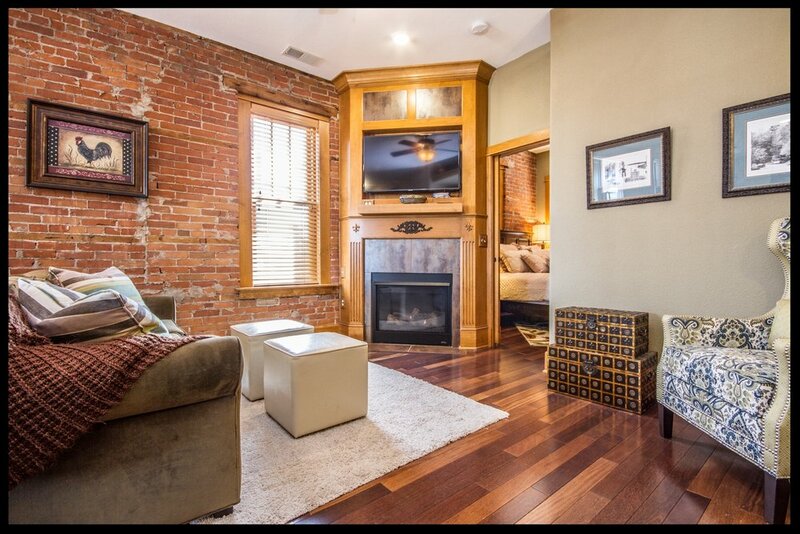 The Fleur De Lis Suite is located on 2nd floor of the Drake House Vacation Rentals, right above Charlotte's Coffee House, which is located in the Historic Millwork District in beautiful downtown Dubuque. It is ideal for one couple, but can sleep 4 people. WHAT MAKES THIS A UNIQUE EXPERIENCE? Being in the Millwork District of Dubuque is a huge advantage to our property. We are close to so many attractions, making your stay handy and convenient to whatever event or purpose you have to visit our beautiful city. Not so mention our coffee house conveniently located just below our vacation rentals.